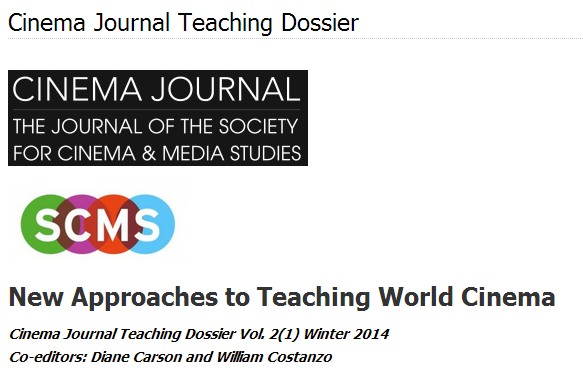 Meta Mazaj and I published a piece in Cinema Journal Teaching Dossier edited by Diane Carson and William Costanzo. The topic: “New Approaches to Teaching World Cinema Since teaching world cinema is our concern as much as writing on it, this was a very useful exercise. The connection between Alfonso Cuarón’s Gravity (2013) and Jonás Cuarón’s short film Aningaaq (2013) presented itself as a perfect parable for what we have come to think of as world cinema, much of it on the terms dictated by Hollywood. But world cinema is polycentric, without a singular power arrogating itself over others, where all the elements are intricately tied together in relationships of power and visibility. The entire issue is full of great contributions. The stewardship of Diane Carson and William Costanzo was constructive and delightful at the same time. They shepherded the group to produce different perspectives on teaching world cinema, just as the topic takes hold in film studies around the world. In assembling these pieces together, the editors have set out the possible parameters for inquiring into the concept while also developing a sound pedagogy for it.